When it comes to highlighter I’m late to the party. I’ve tried a couple of highlighter over the last two years or so but never really liked how they looked on me. I usually only wear little make up or at least make up that doesn’t look obvious. When wearing make-up I still want to look like myself and not like a complete different person. My favourite compliments are those when someone compliments me on the way I look and not on the amazing make-up I’m wearing. This was the main reason why I never really got into highlighter. Those make-up looks when it is really obvious where the highligher was applied because someone’s face sparkles like a disco ball, which was the make up look I mostly saw on girls. However, I always loved the looks when the make-up was subtle and only the glimpse of shine was in the girls face. I kept trying different highlighters but always ended up with the previously mentioned disco ball look. 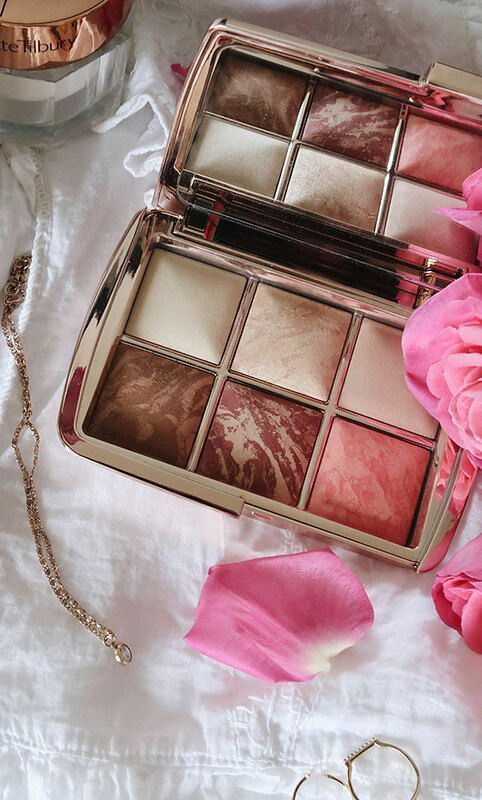 A while ago I came across this gorgeous highlighter and blush from Hourglass. I mean seriously, doesn’t this Ambient Lightening Pallet look this pallet absolutely gorgeous? The only reason why I hesitated to buy highlighter form Hourglass was the hefty price tag. One day though I could not resist and since I needed a new blush as well, I went for this beautiful pallet. And I’m so glad I did! All those highlighter and blushes are and such great quality and the whole pallet lasts for ages. A little goes a very long way and the colours go on so smoothly and give that subtle shine which I love so much. The top row contains Finishing Powder – Diffused Light, Strobe Powder – Hypnotic Strobe Light, Finishing Powder – Dim Light and the. The highlighter reflect with the sunlight and makes the skin look so radiant and smooth. I’m using Diffused Light on top of my concealer to brighten up the area under my eyes, the inner corner of my eyes and on the bridge of my nose. Sometimes I use this highlighter on top of my lips to make them appear fuller. Hypnotic Strobe Light, I use on my cheekbones. If you have larger pores or fine lines, using highlighter and strobe powder often highlights those imperfections. This strobe powder however smoothes those areas while giving an overall impression of smoother skin and highlights them. I’ve put in a link to the hourglass website here for you where they explain how to strobe correctly. The blushes look gorgeous too and they last forever when applied. When I’m wearing one of those blushes I rarely have to apply another layer during the day. The pallet I’m having is a limited edition, which I believe always comes out around Christmas time as it is so high in demand. However, you can get all those powders and blushes separately all year round and I would highly recommend for you to get the shades you like separately as in the pallets you get a lot less product as compared to buying the single ones. Gorgeous and high quality blush and highlighter pallet. Goes on smoothly and leaves you with a radiant looking skin with a subtle shimmery finish. Hourglass cosmetic is not tested on animals neither does Hourglass provide authorization to any third parties to perform animal testing on their products. The highlighter pallets are vegan. Comes with a hefty price tag – £ 59 for three highlighters or blushes. Single blushes cost around £ 32. I would buy single shades rather than the pallet as there is a lot less product in the pallet.